This historical letter was sent by J.S.Mansohn from Berdichev to Paris for Rothschil Brothers (Paris/France). 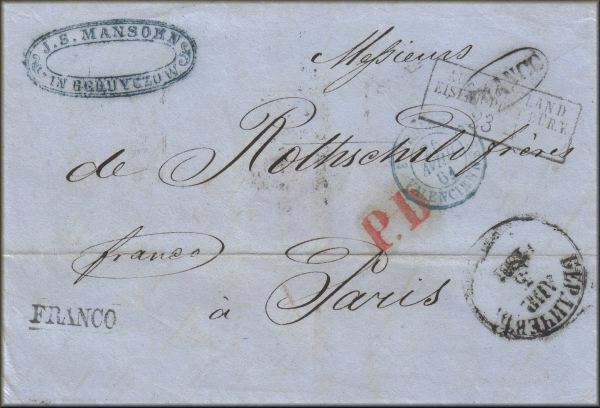 Posted in Berdichev on April 5th, 1861, crossed Eisenberg (Germany), Zelazna Gora (Poland) and Valenciennes (France) before reaching Paris on April 26th, 1861. 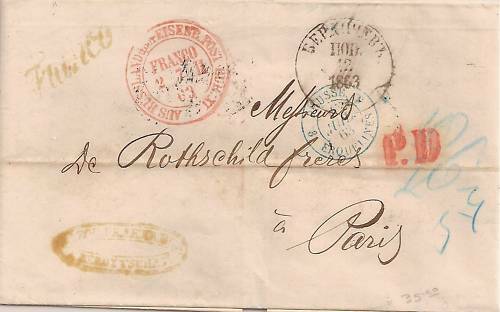 This letter originated in "BERDICHEV" (Ukraine) on June 24, 1863 and was sent to the ROTHSCHILD FRERES in PARIS. I believe this was a bank. The letter traveled to PARIS by way of GERMANY as there is a red double circle German handstamp dated July 2 and indicating that the cover has come from Russia, i.e. "AUS RUSSLAND ..... EISENE POST BUK IX". On the reverse there are two different PARIS receiving handstamps, both dated June 4. The Russian town name is in Cirillic and my translation is BERDICHEV. The writer and recipient, however, have both written the name as BERDITSCHIFF. There are a few other markings beside the Russian town, German Transit, French entry and the senders unreadable oval handstamp. This includes a large orange "P.D" , gold "FRANCO" and some indistinct rate marks. Some of the transit and receiving type handstamps could use a little more research but I don't have the right library.